Containing two large openings for glazing (per door), our Elwy side hung garage doors are ideal if you don’t fancy the more complex glazing bars of either our Brenig or Conway garage doors. As with all our garage doors these can be customised, so for example if you wish you could lift/drop the transom (the horizontal rail immediately below the glazing) to a height of your choosing! 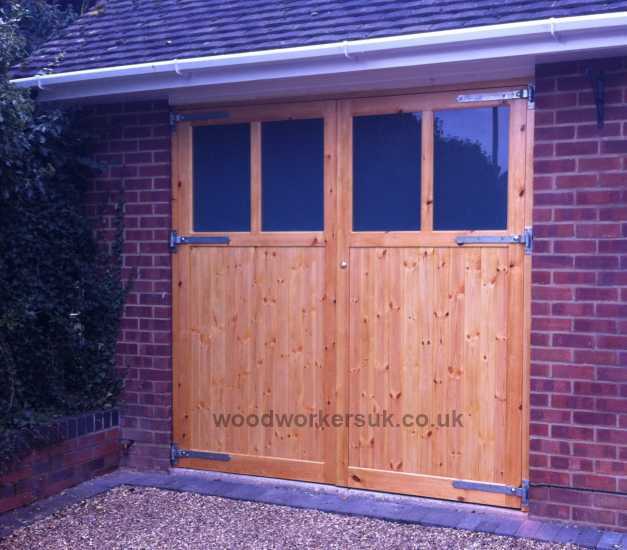 The Elwy garage doors offers the best of both worlds, beautiful timber doors in either softwood or hardwood, as well as the benefit of natural light flooding into your garage! Give your garage a facelift – these stunning doors would adorn any garage and would certainly attract many admiring comments! Why not get in touch for a fully personalised quote on the Elwy doors? 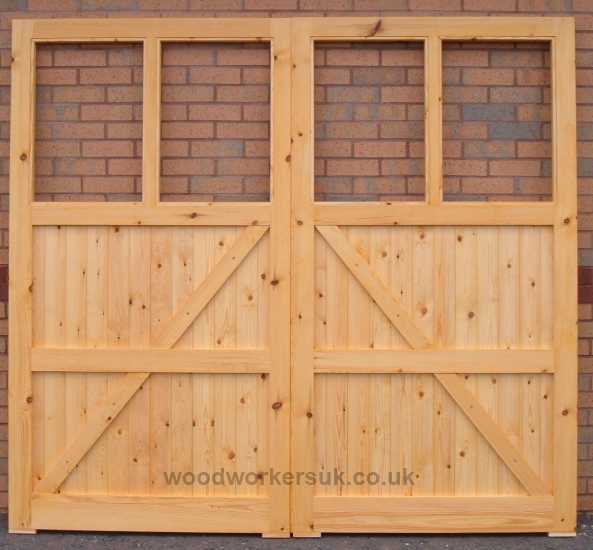 The Elwy guide prices are based on a pair of doors 6ft 6 high x 6ft 6 overall wide (approx 1980mm high x 1980mm), these are NOT from prices, smaller doors will be more economical etc – contact us for a price! All prices are correct time of insertion and are EX VAT. Free delivery to most parts of the UK mainland is included – exclusions do apply, again please contact us. We use Unsorted Scandinavian Redwood, this is sorted for smaller knot size and less of them for better strength. Can be painted or stained. Used as a Mahogany substitute, can be painted or stained. Colour wise varies from a pinky red to dark red colour. Gives the Oak look but without the Oak price tag. Can be stained. The most longer lasting timber on the market! Doesn’t absorb water so doesn’t rot! Can be painted or stained. We use Grade A1 Accoya specially sorted with few knots. Oak needs no introduction. We use the Prime grade of European Oak with fewer knots for unbeatable strength and maximum wow factor! Can be stained. To get a personalised costing on our Elwy wooden garage doors please use the form below. Do you need a garage door frame?